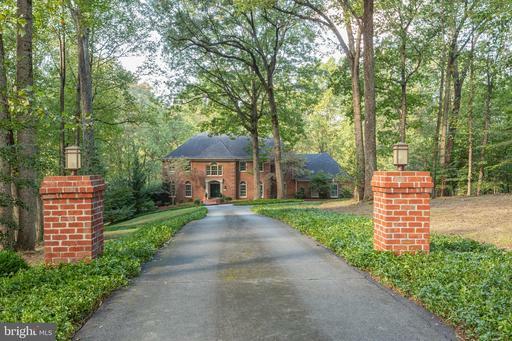 Immerse yourself in nature in this gorgeously appointed all brick colonial located across the street from Riverbend Countys Nature Park and a mile walk along the Potomac River to Great Falls National Park. All rooms give you the feeling of being outside while in your own private sanctuary. 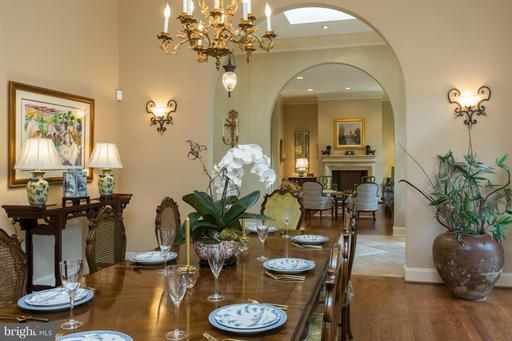 The timeless interiors paired with modern features and finishes create a versatile home suitable for family living and business entertaining. Lavish formal rooms in the front of the house are separated from lovely casual spaces in the back by a unique Gallery ideal for your favorite art pieces. At one end of the Gallery is a den/office with built-in cabinets and wet bar. At the other end is a full sized mud-room, powder room, and laundry room.A contemporary kitchen at the heart of the home is extended by a light-filled breakfast room with windows on three sides that connect you to surrounding nature. It has stainless steel upgraded appliances, granite counter tops and hand-crafted cabinets. The kitchen opens to the family room with a wood-burning stone fireplace and two sets of double-sliding doors that open to the spacious custom deck.The master suite has a spectacular bath with custom cabinets, free-standing soaking tub, and spacious shower. The bedroom looks out on an arc of trees framing the backyard. The master walk-in closet and seating area deserves its own zip code! The other three bedrooms in the upper level are also light and generously sized.The fully finished lower level is illuminated by the afternoon sun. Designed for relaxation and fitness, it includes a full bath, fifth bedroom, exercise room, wood-burning brick fireplace and a wet bar with a two-burner stove and beverage center. A flagstone patio integrates the lower level with the outdoors.This immaculate move-in ready home has been lovingly maintained and updated by the second owners who have lived there 23 years. Some of the many improvements include the master bath, master walk-in closet, large, custom backyard deck and side flagstone patio, extensive landscaping and outdoor lighting, new carpet, new paint and much more. Additionally, an over-sized three car garage with modular cabinets and wall-mounted storage is the handymans heaven.Whatever the time of the year, the adjacent Riverbend County Park and nearby Great Falls National Park offer unlimited outdoor activities such as bird watching, hiking, biking, kayaking, fishing, picnicking, and experiencing the magnificent bluebells and spectacular cascading falls.Enjoy all this while being only a 5-minute drive from the Great Falls Village Center. There you find your grocery and pharmacy, ethnic restaurants, doctors, dentists, banks, drycleaners and everything you need. It is also where the unique, family-friendly community of Great Falls comes together for its summer Sunday Concerts on the Green, 4th of July Parade, Halloween, Holiday Tree Lighting and Easter Egg Hunt. The semi-public Great Falls Swim and Tennis Club and private River Bend Golf Country Club are also only 5 minutes away.Come see it. Feel it. Own it.